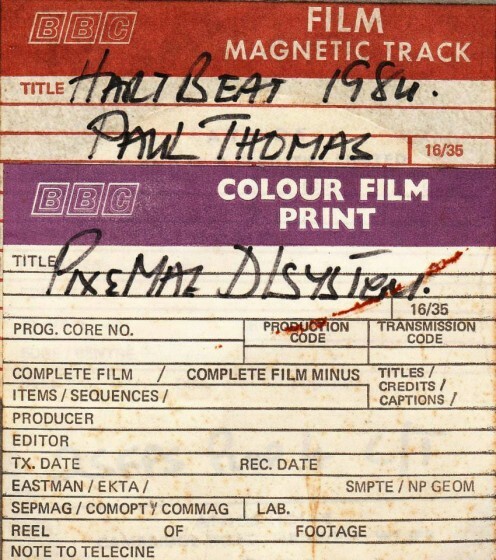 I recently uploaded a collection of my BBC Hartbeat films to YouTube. This article covers the background story of those films. I am also planning an exhibition called Paul Thomas at the BBC. It will cover about 15 years. 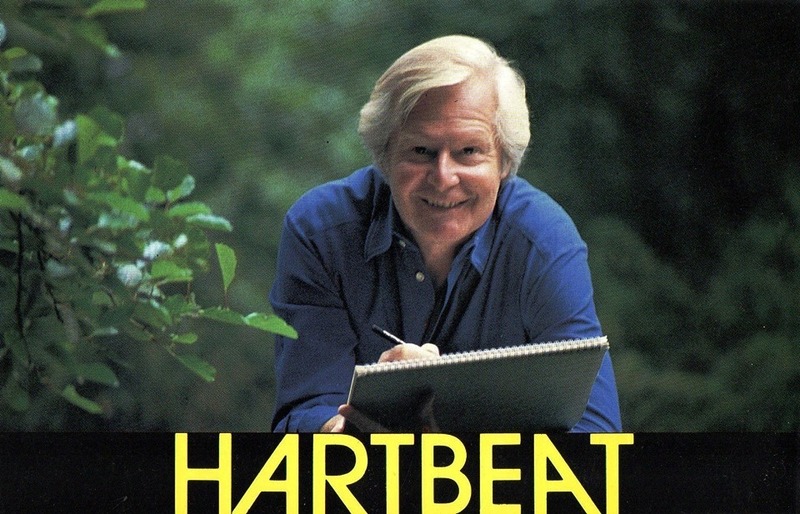 ‘Hartbeat’ was the follow up to the classic BBC TV show ‘Take Hart’. I had only been able to contribute to two series before having to start again with new ideas for a brand new format. Tony Hart would be joined by four female co presenters. The programme would appear modern and have a faster pace. My contributions began with a telephone conversation with my producer and a letter containing suggested themes to find ideas for. The process would begin as scribbles in my note books. When ready a meeting would be arranged at the ‘Hartbeat office. I would arrive armed with storyboards and a very positive attitude. All my films for the programme were made in my home studio and filmed, edited and have soundtracks created at BBC TV Centre. 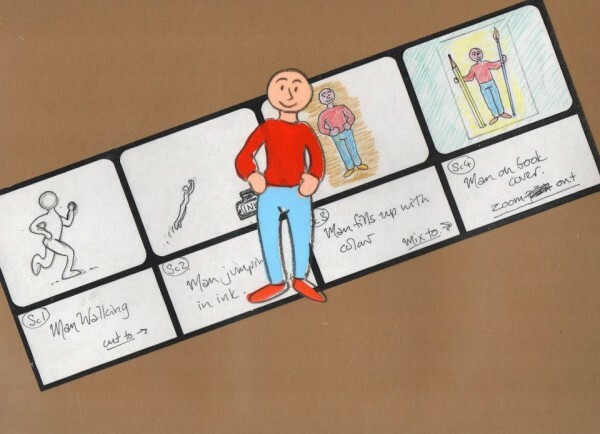 I used cels of various field sizes and found my techniques and desire to have a textural feel to my films improved. 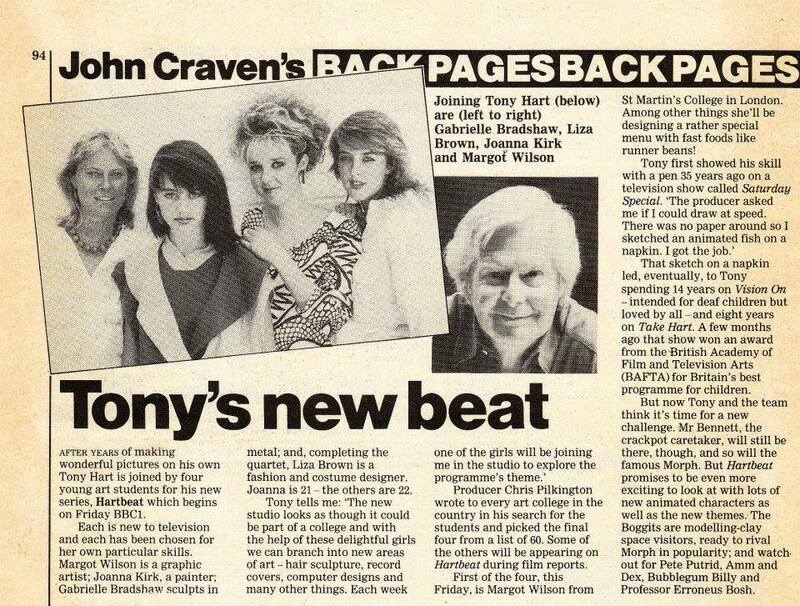 ‘Hartbeat’ was my playground. I would have a lot of fun and realise a lot of ideas. A BBC film can label. 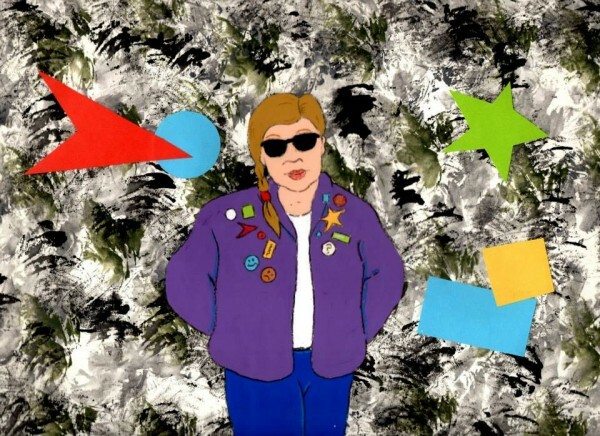 BUBBLEGUM BILLY – I created a gang of friends in full colour against a background of black and white. The soundtrack was put together with music from the BBC library and vocals from David Owen Smith and the ‘Hartbeat’ office girls. This track is called ‘Base Pattern B’. The voice of ‘Morph’, Peter Harwood, created the soundtrack and all my soundtracks with the programme. This was to be my first broadcast reference to ‘Yellow Submarine’ such an inspiration on my work. 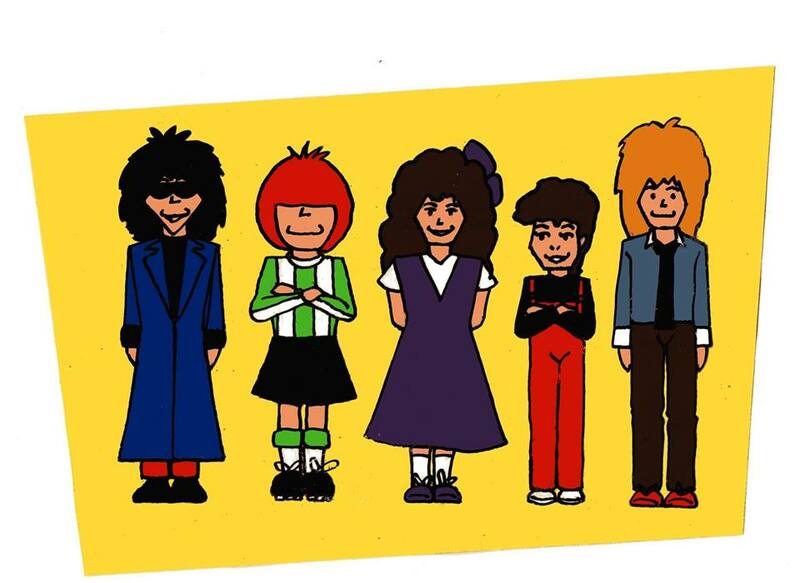 My gang consisted of Danielz (from T.Rextasy). School friend Gary Florance. ‘Grange Hill’ actress Lisa East. Kate Bush and myself in the lead role with stories using puns on gum hence ‘Gum Boots’ and ‘Choo Choo Train’. Seeking a grainy real life background Gary Florance and I went searching for an ideal street in south east London. We found it with classic Victorian houses and a front wall. My first offering to the show in 1984 had a visually strong style and lots of potential. However with the new programme structure of not wishing to pursue regular characters Bubblegum Billy was never to be seen again. It did make it into print though being the only reference ever to be made of my characters in the ‘Radio Times’. The clapperboard I used between shots for Bubblegum Billy. KALIZASCOPES – I reversed the Bubblegum Billy look for an idea of black and white photographs against full colour animated characters and backgrounds. 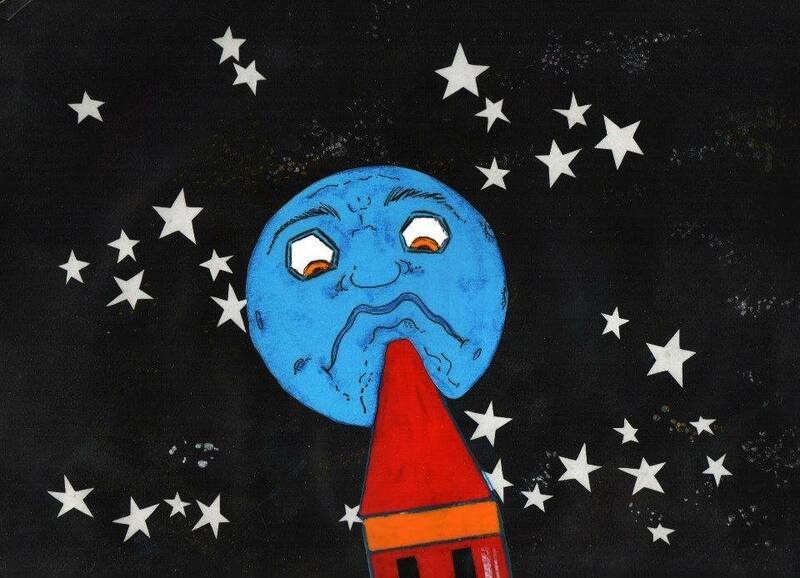 I suggested Tony Hart as the star but producer Christopher Pilkington insisted on co programme presenter Liza Brown. I worked out all the key positions for Liza and a photo session with Barry Boxall was arranged on the tenth of July 1986 at TV Centre. Chris was right. Liza brought so much more to the idea than I had hoped for with inspired facial expressions and poses. On receiving the printed photographs I worked out the animation using a video line tester at the Halas and Batchelor studios in London. This was an idea I was happy to continue with hoping to animate other cast members. That didn’t happen. Things were changing. Paul Thomas and Liza Brown at the photo shoot for Kalizascopes. TRAFFIC SIGNS – Producer Christopher Pilkington left the show and handed over to Chris Tandy. I had to be interviewed again as Chris was unfamiliar with my work. 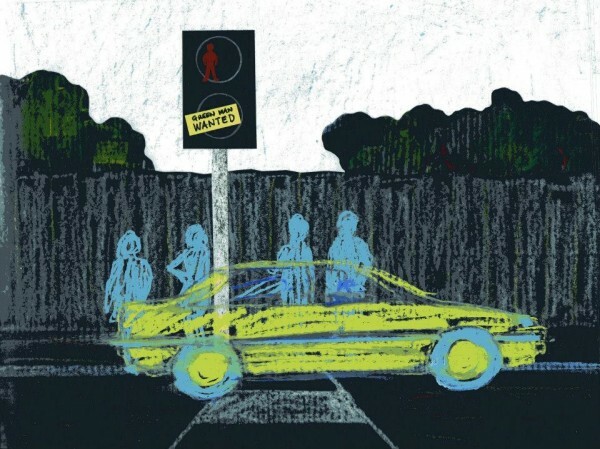 My proposal was inspired by a copy of the highway code and my being impressed with the graphic style. There was plenty of material for humorous gags. My idea of bringing traffic signs to life thankfully impressed Chris. I took a new approach to the idea and chose to cut out all the characters from black paper and stick them on cels. The back grounds were in oil pastel on black card. This gave a new visual texture to my work. 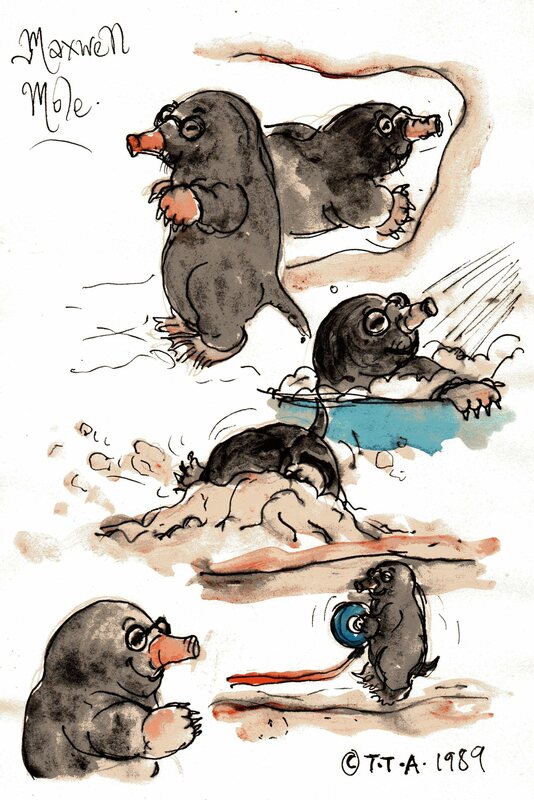 I had finally broken away from inked and painted cels. 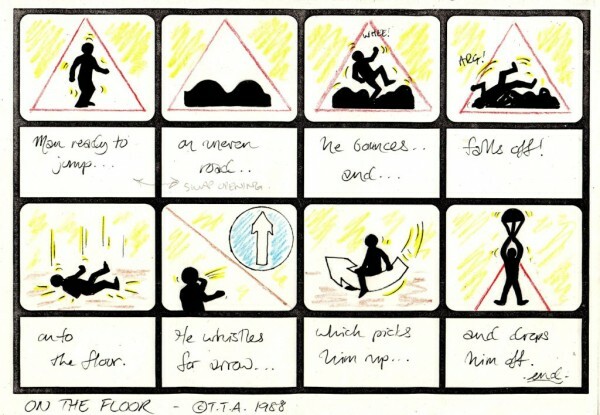 A storyboard for ‘Traffic Signs’. 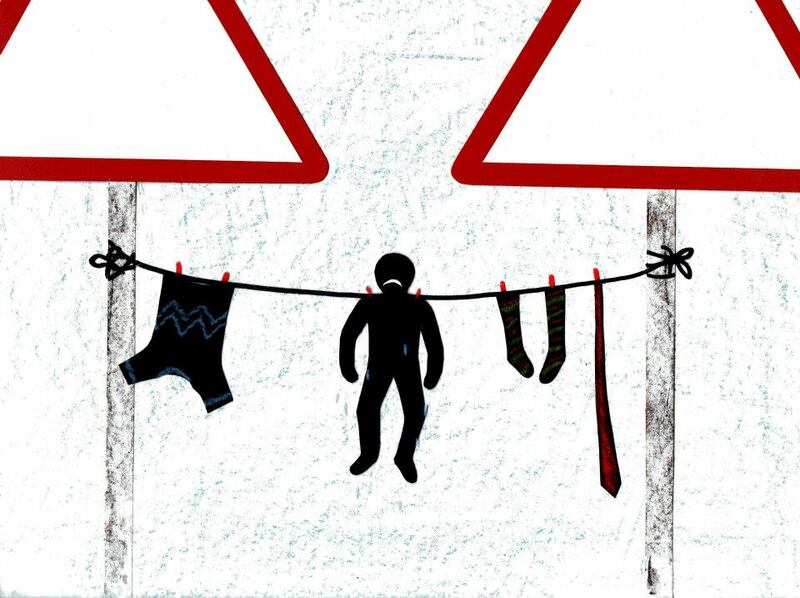 TIGERTOONS – With the interest in ‘Traffic Signs’ over I decided to create one-off’s and make the most of my position. I would let myself go pushing my abilities into unknown territories. The cel was my canvas. I put everything on it. Paint. Pastels. Wax. Cut-out’s. Paper. Card and used the classic special effect of ‘Ripple Glass’. My bag of tricks grew but play time was about to end. 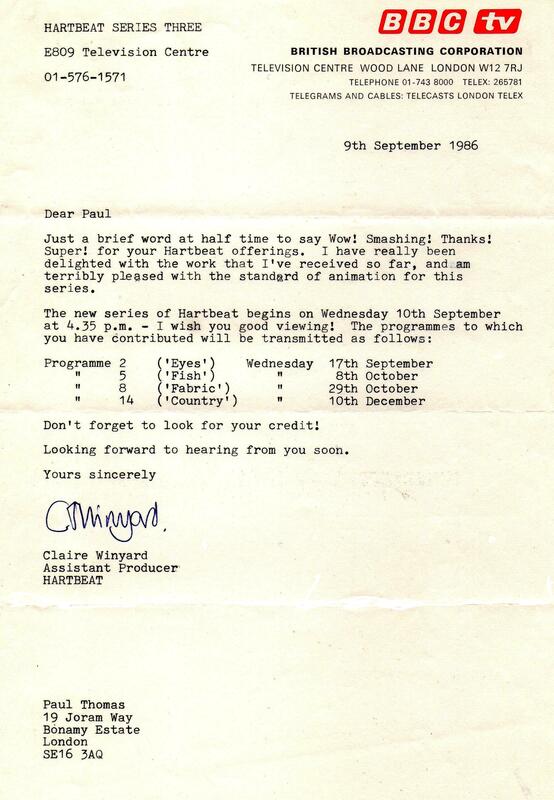 In 1990 I was told the number of animators on the programme was being reduced and therefore my services were no longer required. I spoke with Tony Hart about this. He was sympathetic and I recall a comment he made that I had not even been presented with a certificate to say I had worked on his show. 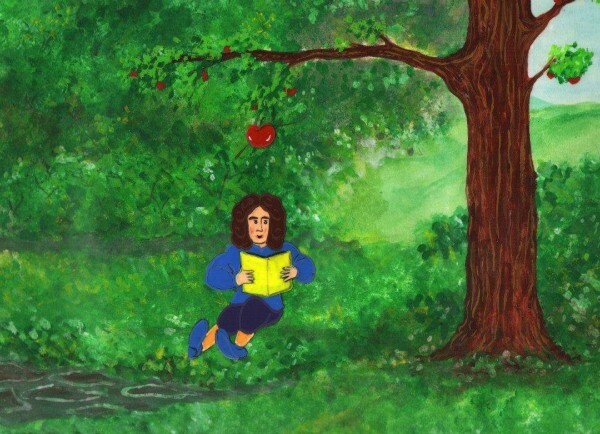 My animated work though had matured with such an experience and I had used the medium to greater success than with ‘Take Hart’. A sketch from ‘The Mole Film’ for Tigertoons. 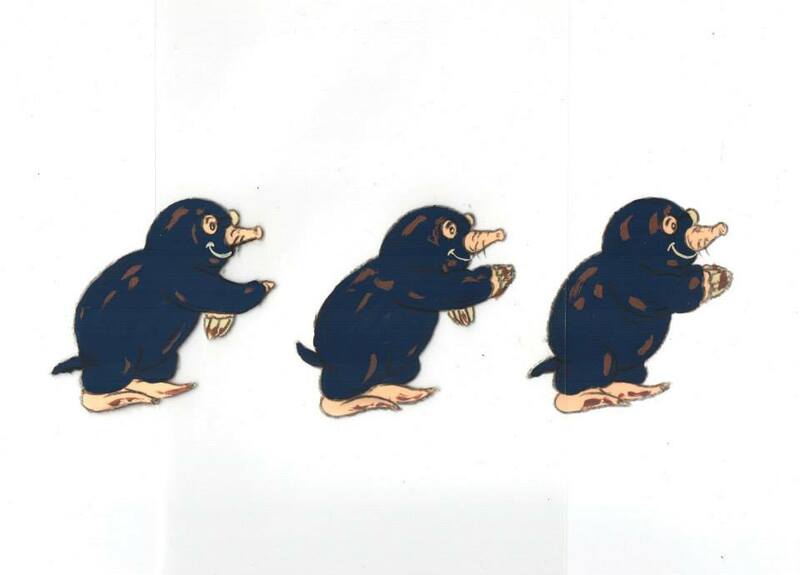 Three cels in animated sequence from ‘The Mole Film’.